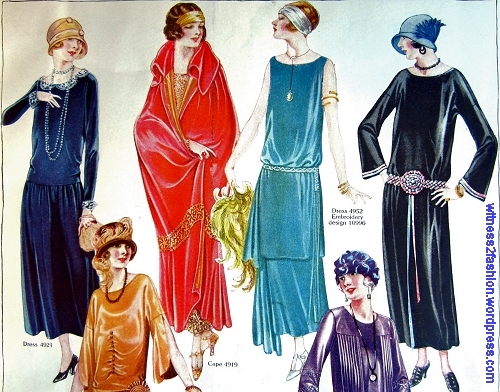 1925 was a year of rapid change in women’s fashions. In addition to rising hemlines, this year marked the beginning of the end for tubular dresses worn over bust-flattening undergarments, and the introduction of a more feminine silhouette. 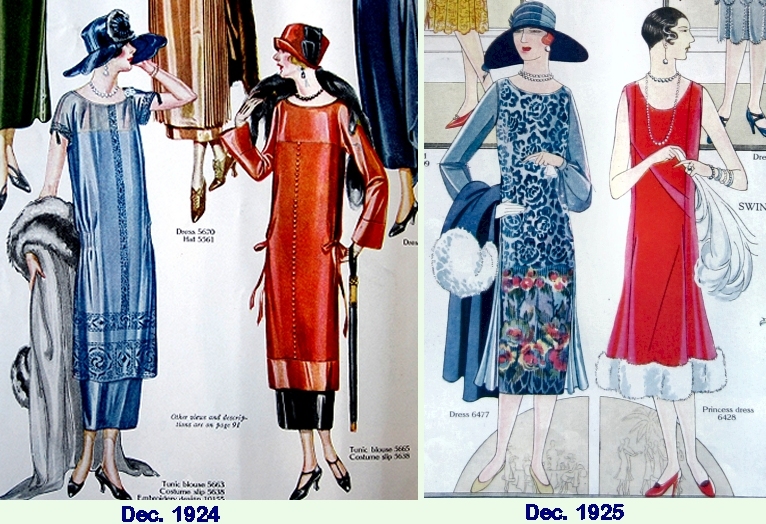 To give an idea of how quickly styles changed, I’ll show some images from Delineator magazine that appeared just one year apart — some from the end of 1924, and some from the end of 1925. These two coats — pictured one month apart — were the latest styles for the end of 1924. 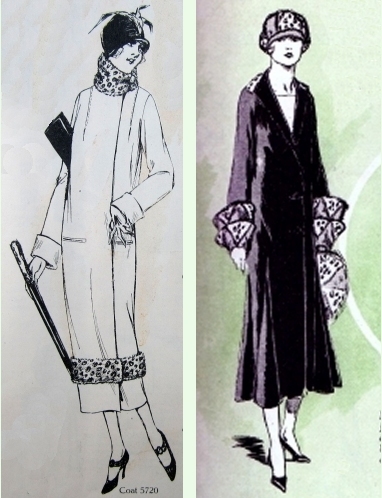 Left: Butterick coat pattern, Dec. 1924. Right: Lanvin coat, Jan. 1925. 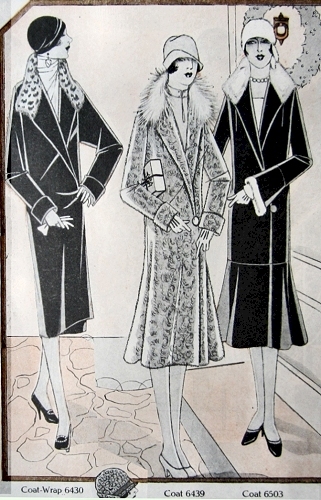 Butterick coat patterns from December, 1925. These three coats look modern (or moderne) — the way we usually picture the 1920s. In one year, subtle changes in fit and proportion have severed the connection with the long, tubular fashions that began the decade. 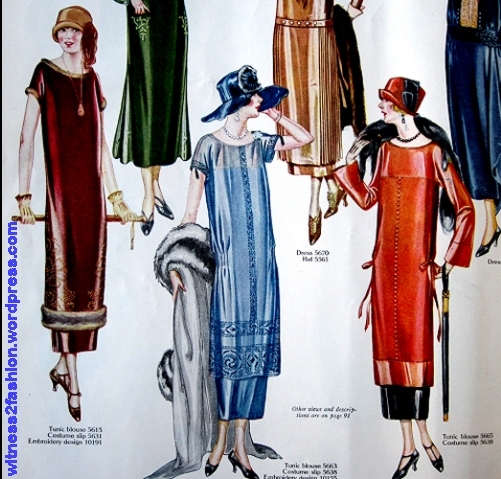 Women’s Dresses, December 1924, from Butterick’s Delineator magazine. These 1924 tunic dresses are ‘tubular’, falling straight from the shoulders over a low, flattened bust (especially noticeable at far left.) Tunic styles often show indecision about skirt length: there is a short hem and a long hem. 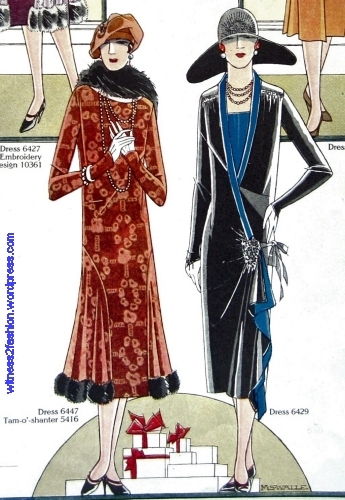 Women’s Dresses, December 1925, from Butterick’s Delineator magazine. Twelve months later, the difference in hem length is not the only big change; while the tunic dresses of 1924 got narrower at the bottom, these dresses have some flare from the waist or hip to the hems. The real innovation can be seen in the red gown; it is a new “princess line” dress. The vertical seams allow it to be shaped to the body, curving out slightly over the bust and curving in slightly at the loosely fitted waist. There would be little point in flattening your chest to wear such a dress, although some older women clung to their familiar undergarments. Evening Wrap Coat and Evening Dress, January 1924. 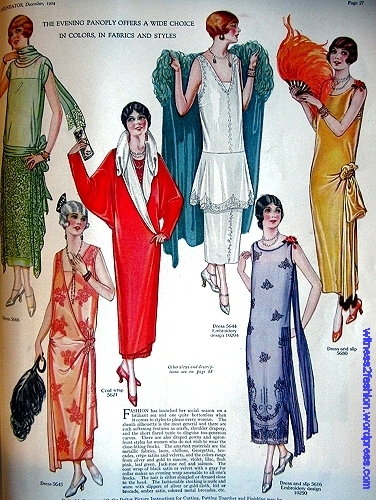 Evening Wrap Coat and Evening Dresses, December 1924. Evening Wrap Coat and Evening Dresses, December, 1925. 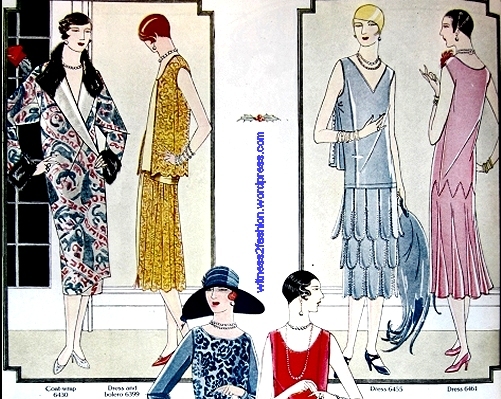 The loosely belted columnar dress (January 1924) has been replaced with dresses that have distinct bodices and skirts, a strong accent at the hips, and geometric, Art Deco details. The effect is crisper and shorter. All the models now wear the mannish, ‘shingled’ hair style. 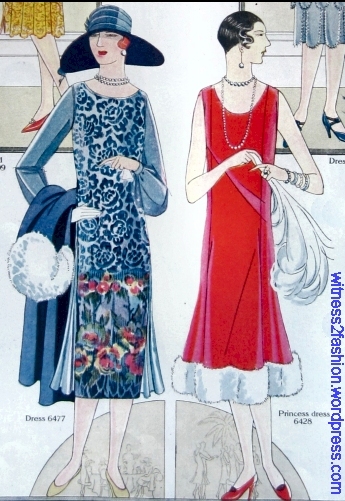 Surplice Closing Dress (right) from December 1925. In one year, the surplice dress has gone from baggy to streamlined. Coming soon: Dresses for teens and young women, 1924 and 1925. Fascinating! Our stereotype of a “20s” dress actually comes from a very short segment of the 1920s. When you said, “very short segment of the twenties,” was that a pun? If so, very apt! 1926-29 dresses were markedly shorter. Fashions just refuse to fall into neat decades, although that would make history much simpler…. I was dating some sixties-seventies patterns recently and got a surprise; even though I was an adult and buying my own clothes then, I forgot how often early 70s styles co-existed with the 60s.